25% of our patients are contact lens wearers and many choose to take advantage of our direct debit facility. This covers all the products and services we provide and spreads the costs over the year in managable monthly payments. The direct debits start once the lenses have been collected so no fees are paid upfront. 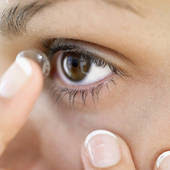 For health reasons it is a legal requirement that contact lens patients are checked on an annual basis. Lenses: start at £12.00 per month (Monthlies). Solutions: £3.00 or £5.00 depending on the type. Generally the need of each patient determines what lenses they require and our suppliers include CooperVision, Alcon, Johnson and Johnson, No 7, Mark Ennovy and Bausch and Lomb. Those who choose to opt for the direct debit scheme not only receive savings on their overall costs, they also get an additional 10% discount on any complete pairs of spectacles purchased.